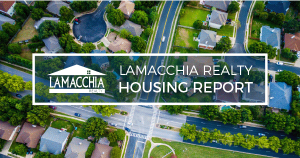 Lamacchia Realty Home Search App Even Better Than Before! 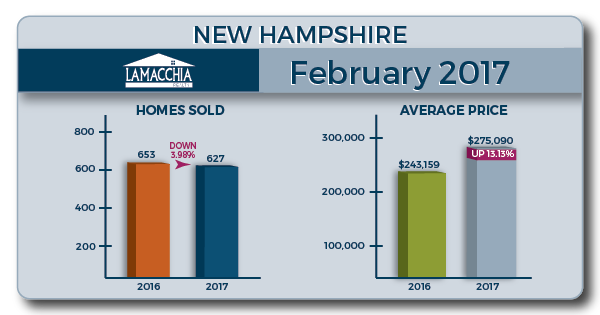 The Lamacchia Housing Report presents overall home sale statistics and highlights the average sale prices for single family homes, condominiums, and multi-family homes in Massachusetts and Southern New Hampshire for February 2017 compared to February 2016. It also looks at other metrics like Homes Listed and Pending, as they are often the best indicators for predicting future trends in the market. Overall, home sales in February 2017 in MA fell 6.5% compared to February of 2016, while average home sale prices rose 7%. This decrease in home sales for February comes in the wake of a strong January, where a change in the number of homes sold was positive in all three categories – single families, condos, and multi-families. This February we see the opposite: the number of homes sold fell in every category. Multi-families saw the largest drop, falling from 466 homes sold in February 2016 to 427 in February 2017. Overall, the number of homes sold in Massachusetts fell from 4,484 to 4,194. The change in average price, however, was positive across the board for February in MA. The overall average price rose 7% (from $371,378 to $398,271), while individual categories had growth ranging from 5 – 9%. The category with the most price growth was condos – though it was close between condos (9.98% – from $284,107 to $312,467) and multi-families (9.81% – from $393,650 to $432,283). Southern New Hampshire’s February, just like its January, had data that fluctuated widely across different housing categories. Though home sale numbers were down overall 4%, multi-family homes saw a 10% increase in sales, and single family homes saw a decrease of 9%. Average sale price was similarly inconsistent. As a whole, Southern New Hampshire prices rose 13% (from $243,159 in February 2016 to $275,090 in February 2017). Single families saw an average price increase of 22% – over $50,000 – from $251,261 to $307,101. Multi-families saw the biggest decrease in average price, falling from $273,783 to $233,701, a fall of almost 15%. There was a 10% decrease in the number of homes listed. 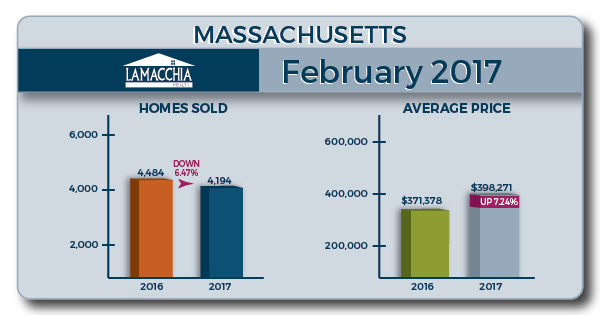 There were 6,260 homes listed for sale in Massachusetts in February 2017 compared to 6,940 in February 2016. This does not help the low inventory problem that we have. March to date is down 23%. There were 6,286 homes that went pending in February 2017 in MLSPIN compared to 6,957 in February 2016, which represents a decrease of just under 10%. If pendings continue to be down, sales will follow suit. As of March 17th, pending sales were down about 10% for the month. This will impact sales in the months to come. Overall, it’s not surprising that February sales are down considering that pending sales were down in December 2016 and January 2017. It’s not for lack of demand- it’s there, but inventory isn’t. Inventory has been down to around 13,000 homes on the market for the past 60 days; the lowest it’s been since the early 2000’s. In fact, year to date, homes listed for sale are down 10%. This lack of inventory is catching up to us and we see this in the ensuing cycle of people hesitating to list their homes because they can’t find a home they want. March pending sales are, so far, down 10% and if this continues, sales will continue to be down.